So i did it-never thought i would but i made my daughter her first Halloween costume ever! 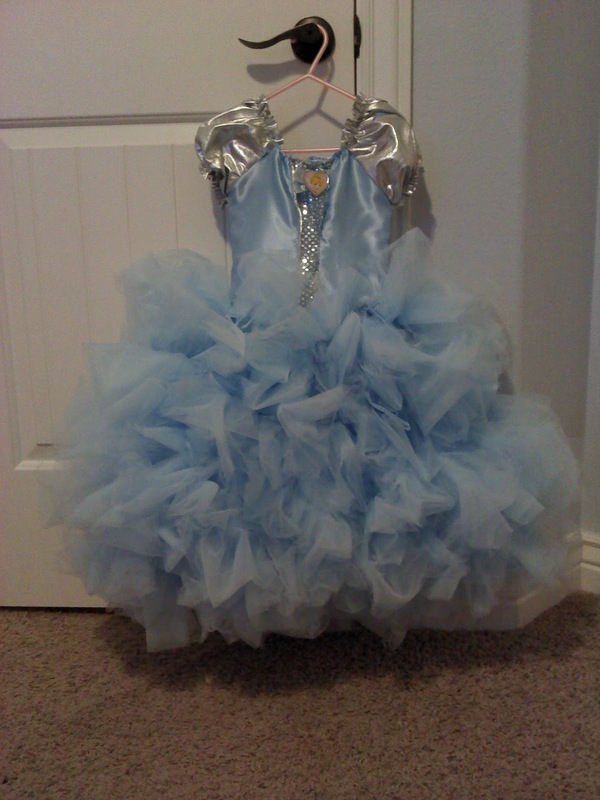 The most fluffy,puffy,twirly Cinderella dress ever, (i probably bought Joann's out of light blue tulle) I'm guessing i used 20 yards but it was SO worth it!! For the top i made my own simple pattern-pieced and sewed it together, the skirt i used THIS amazing tutorial! It's done! And it actually turned out pretty nice! I did get her a crown that actually matched the dress perfectly but it went missing-i was pretty bummed :( So instead i got to make her a cute headband instead, thankfully she still calls it her "crown"
The little munchkin couldn't love it more, if she could she would wear it all day everyday! So what are you kids going to be for Halloween? WoW! This is way too pretty! Just precious. You did a fantastic job! Your costume is DARLING!!!! Will you add a couple of pictures to the Flickr group? I would love to feature it----I LOVE it! Soo awesome! You did a great job and I just adore the mounds of tulle at the bottom! Thanks so much for sharing with the Pink Hippo party.. can't wait to see what you share next! That is adorable! Great job! I love it. The skirt is AWESOME!!! Great job!!! That is ADORABLE!!! You can tell that she just loves it! That is awesome!! I am making a Rapunzel costume for my niece. The tulle skirt looks so fun on this one!! 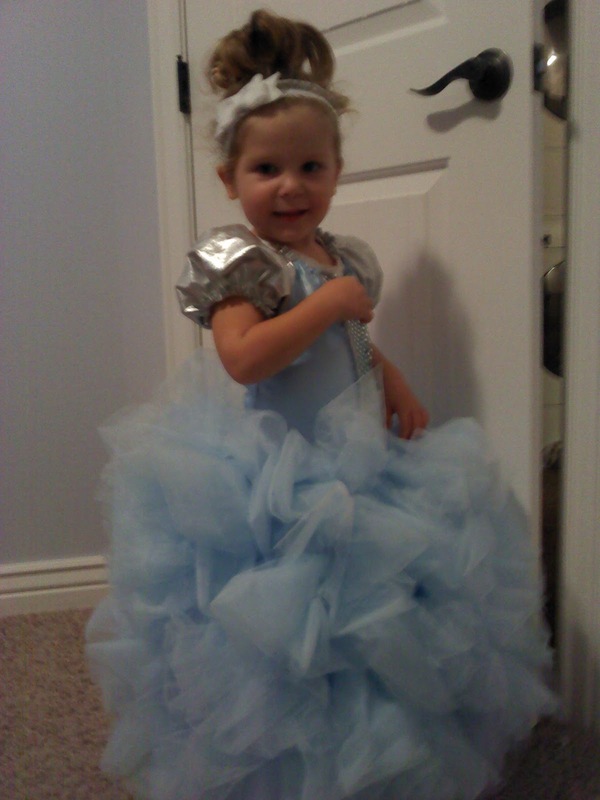 What a pretty little Cindrella! You did a beautiful job! I found you through Craft Catwalk. Thanks for sharing! What a GORGEOUS dress! I'm not surprised she wants to wear it all the time! Great job! It looks so amazing!! I am visiting from Ninth Street Notions and I am a new follower! This is beyond adorable! It's like a perfect cloud of girly-ness! You did a fantastic job! My favorite halloween costumes as a kid were the ones my mom made me! Oh, to have a daughter. Saw this at CRAFT...what a beautiful dress! Your daughter looks so happy wearing it! It looks amazing!! You did a fabulous job..thanks for sharing! How cute is that! She looks every bit the princess in it! Great job! WOW great looking costume! Your daughter looks beautiful! and who wouldn't want to wear this everyday! This is beyond gorgeous! Congrats. She looks beautiful and so happy in your handiwork. Just found you via A Diamond in the Stuff and will be checking back frequently! this dress is incredible! The work you put into it! WOW! Great job! WOW!!! 20 yards of tulle!!! That is one gorgeous little outfit!!! Thats amazing!! I love it!!! Super cute. No wonder she loves it! Gorgeous! It makes me want to have another little girle. It looks fantastic! I love it. I'm making my daughter a Rapunzel costume for halloween, but will be making her all of the princesses as part of her Christmas present. I love how you did the skirt...very pretty! I love this!! Pinning for next year for my little princess. Thanks for sharing! That is absolutely adorable!!!!!!!!!!! Once Halloween hits she'll be wearing it out. WOW that turned out amazing! I love it! I hope you'll link this up this weekend at scrappy saturdays @ candacecreations.blogspot.com! You did an amazing job on that dress!! What a darling dress! Thanks for sharing @'Sew Cute Tuesday'! Adorable! I love how you did the skirt part! Beautiful job! thanks for sharing your creativity at fridays unfolded! 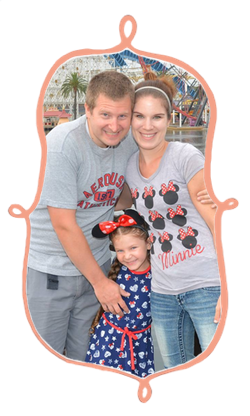 This is absolutely adorable (and your little girl is too)! You did a wonderful job. Last year I made my son's first costume too and he wanted to wear it a whole bunch too. He was a dinosaur and he's going to be a dinosaur again this year (we all are). Hope you all have a fun Halloween! I just found your blog and am your newest follower. This dress is fantastic! Thanks for creating such a fun blog full of inspiration. This is SO great! Seriously, the most adorable costume I've seen in a long time. And I'm seriously impressed by that skirt. SO great! Wow, you made that?! It looks great! Stopping by from the blog hop. I'm a new follower. Hi, coming over from FNF Blog Hop!!! I love your blog and am now following via GFC!! What an adorable costume! Love it!!! I'm a new follower and found you on Happy Hour Project. Hop over and say hi if you get a chance. The costume is wonderful and your daughter is such a cutie pie! Thank you for linking to the open House party this week. Oh my goodness this is just gorgeous! Much better ( and I'm sure much better made) than any you could buy! And your model is adorable! This is too, too cute! 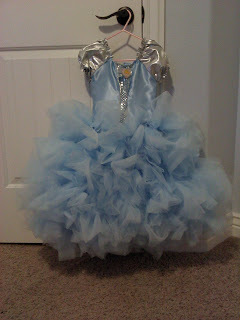 What little girl would be over the moon for a Cinderella dress?? I know I would have been! Pinning this so I can remember to make one when my little girl is a little bit older. Great job! Oh my cuteness!!! You did an amazing job!! My daughter would love this. I might just have to make one. Thanks for the inspiration!! This is the cutest! I love how sweet it turned out! I bet your little girl wants to wear it everyday--it's adorable! And your model is just too cute! Thanks for sharing @ Show & Share. So glad that you did! What a cute dress! Did you make that? You are very talented with sewing to be able to do all those ruffles! Stopping by from the blog hop (although late) and following you thru GFC. I would love a follow back when you get the chance. Thanks so much for your help and have a great week! Hey! Just wanted to let you know that I featured this today from the Show & Share link party! Congrats! Grab a button if you'd like! 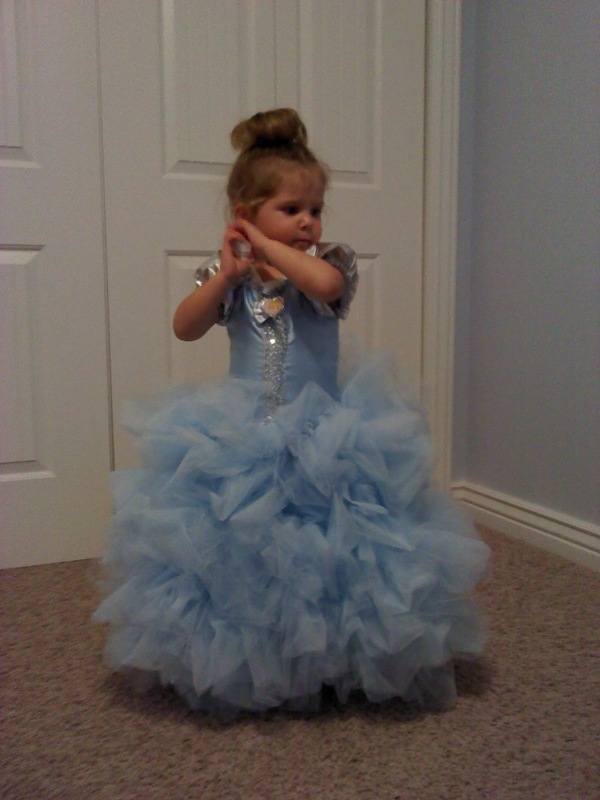 Your daughter looks stunning in her cinderella dress. Hugd Mrs A.
Oh it is simply mindblowing-- and your daughter looks like a beautiful princess! That is so stinking cute! 20 yards of tulle was definitely worth it!!! WOW, great job on the dress. Your little cutie patootie looks like she loves it. I'm having a giveaway and looking for sewing pattern testers. Check it out if you're interested! Oh my goodness, that dress is so cute! 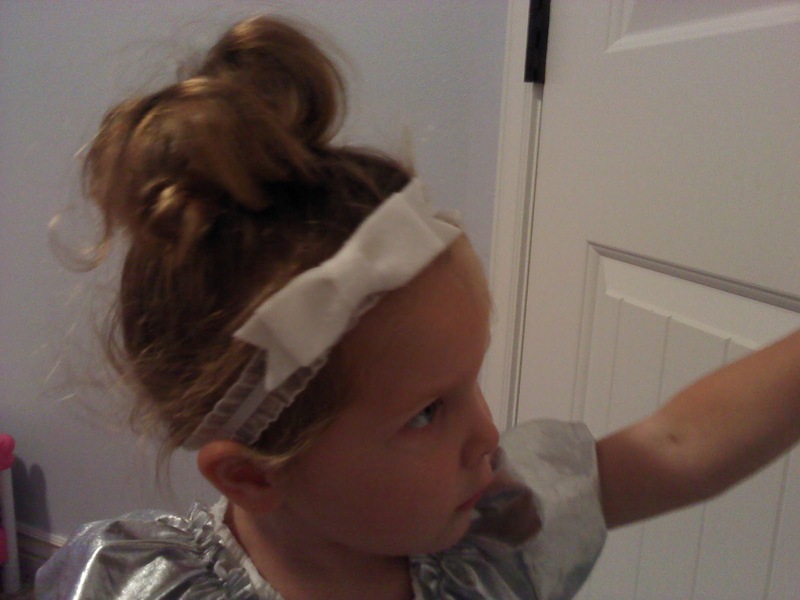 I have a two year old niece who would also want to wear it all day every day. I iwsh I had seen this earlier, I might have copied your costume idea. There's always next year though. Great job. Oh my gosh this costume is DARLING!!!! I'm thinking one of my daughters needs to be Cinderella next year! So glad you linked up with us at Show & Share! This is by far the best Cinderella costume I have seen! Thank you so much for linking up with the frog!! You are the Frog Favorite this week and will be featured during the linky starting tomorrow. Your button is already on the sidebar for all to see. Ohhh my goodness this is AMAZING I don't blame your little cutie for wanting to wear it every day! It is beautiful!!! Ohhhhh-I-LOVE-it! Thank you SO much for linking up at crafty scrappy happy! I can't wait to have little ones to make stuff like this for! Congrats! This was last week's most viewed link. Please feel free to drop by and grab a button and link up anything else you've been up to. This dress is adorable!!! My daughter would love it!! Would you mind telling me how you made it look so poofy at the bottom? Coolest dress ever! She makes a perfectly beautiful Cinderella! Nice job mom :) Thanks for linking up with us! This is absolutely ADORABLE! I can only imagine if I would have had this costume when I was little. I'd have slept in it! Great job!!!!!! She's adorable and what a great job you did! I'm sure she'll remember this for years to come. This is amazing, thanks so much for linking up!! I featured you this week! Hope to see you link up tomorrow! Oh my goodness!! Great job!!! I love love love this costume! You seriously did amazing! And thanks so much for linking up to Mini Mod last week! Sorry it took me so long to stop by! I don't blame her for feeling like a princess in that dress. It's remarkable! And so, so adorable, too. She is as cute as a button! You did an amazing job on this dress. Boo Tee FUL!!!! Sew impressed and what a perfect Cinderella! SO precious! You did a fabulous job. I don't blame her; I'd want to wear it every day too!! Thanks for linking at One Artsy Mama! Too sweet. I wanted to stop by and thank you for linking this delightful project up to Motivated Monday at BeColorful and let you know that I featured you this week. Thanks for sharing this awesome costume with Seasonal Sundays! Hope you'll join me next week. Success is right! Awesome, awesome job. Thanks for sharing at Taking A Timeout Thursday! Hope to see you again this week! Lovely! I featured you on Make It Wear It. Stop by and grab a featured button if you'd like! thanks for linking up with my Show and Share party. Ummm....you're saying your dress turned out PRETTY nice? Seriously!?! That is magnificent! Sure beats all the costumes I made for my kids with duct tape and a stapler - ha! So, so cute!!! My daughter would go nuts over this if she saw it!!!!! wow, absolutely beautiful and I love the dress too! The silver sleeves really make it all come together! I will definitely have to do this for my granddaughter! What a gorgeous costume! As a side note, you can never have enough tulle! So you know, I'm newly following you back via 'The Sundae Hop." What a beautiful costume. you've done outstanding. I would want to wear it everyday myself. Seriously? That is amazing!! <3 IT!!! Did you make the top or did you take that off another dress? Was it hard? I'm super dumb when it comes to sewing.. but I try. I made the top,for me it was kind of hard but just because i was still new to sewing. This is so adorable but it looks like the link to the skirt tutorial no longer works- bummer! Do you know of another tutorial that would work? Thanks!